The Cowfish Sushi Burger Bar – full menu, HD photos, and details! Forget The Cowfish Sushi Burger Bar’s colorful, off-kilter decor or its nifty virtual aquariums (to help guests while away the time when waiting for a seat) – the real star of this highly unusual restaurant is its tri-fold menu. 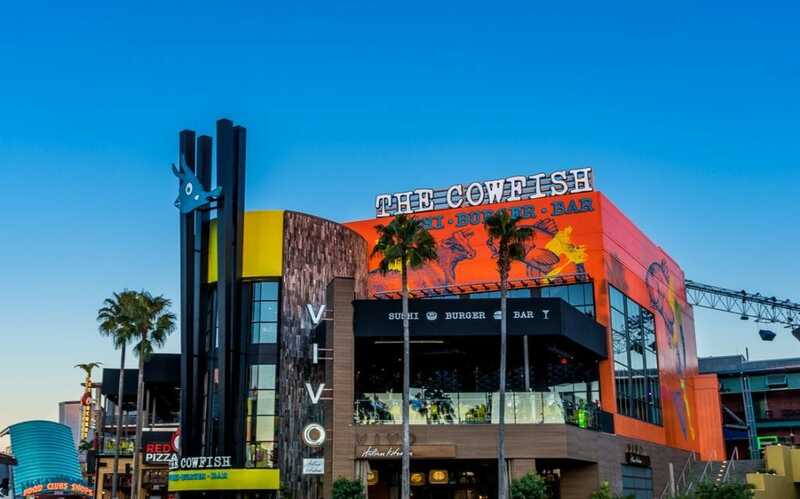 Top-notch gourmet burgers, gorgeous sushi, and an one-of-a-kind hybrid – called burgushi, which makes, say, sushi rolls out of traditional burger components – essentially mean Cowfish is three separate restaurants that are rolled into one. If all that still isn’t enough for you, take a gander at the unique cowfish photo op outside the front door, try one of the absolutely delectable hand-spun milkshakes (The Cowfish was the first Toothsome Chocolate Emporium, albeit smaller and not quite as crazy with the desserts), or indulge with the various premium sake and exotic martinis. It’s hard to go wrong here, aesthetically or gastronomically. Sunday through Thursday, 11:00 am to 11:00 pm; Friday and Saturday, 11:00 am to midnight. Reservations are not available, but you can call 407-224-2691 for any further info. All burgers made with a half pound of premium Creekstone Farms black angus beef.